Some humans may have an unconscious ability to sense Earth’s magnetic field, according to a provocative new study published today in the journal eNeuro. Years of exciting but often inconclusive experiments have led such research to fade in popularity. Now, a veteran in the field is hoping to revive interest with some of the strongest evidence yet that humans may have a magnetic sense buried deep within the brain. It is well known many creatures, from frogs to lobsters, can sense Earth’s magnetic field, while others also rely on it for navigation (think: butterflies and sea turtles). Caltech geoscientist Joseph Kirschvink and neuroscientist Shin Shimojo decided to revisit the issue, this time with a rather sophisticated study design. 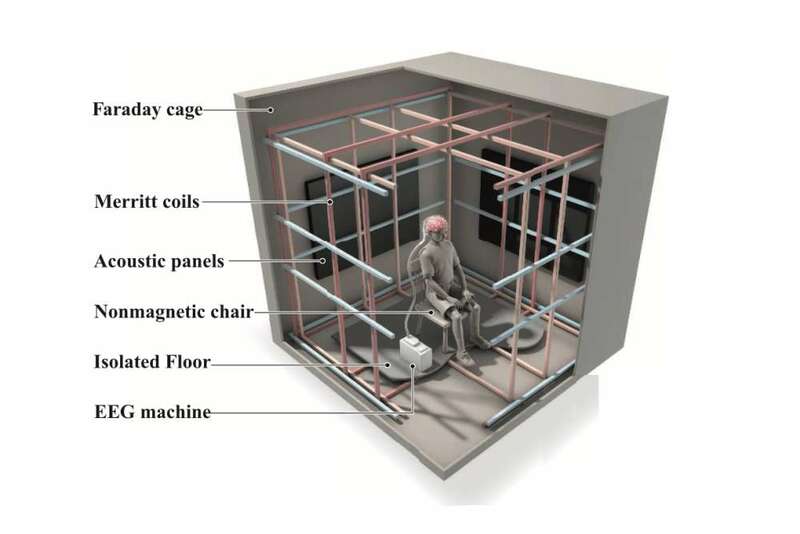 For the experiment, 34 adult volunteers sat in total darkness in a six-sided Faraday Cage made out of aluminum. Square coils lined the chamber, allowing the team to control the flow of electric current and create a magnetic field. Inside the chamber, participants sat on a wooden chair with 64 electrodes attached to their scalp to monitor brain wave activity. Acoustic foam panels were attached to the walls to dampen echoes, and they grounded the cage at one corner with copper wire that was connected to the copper plumbing in the sub-basement of the building. The hour-long experiment consisted of multiple 7-minute experimental runs, with a magnetic field rotating over 100 milliseconds every 2-3 seconds. A control condition with no magnetic field was mixed into the trial as well. When the participants exited the dark chamber, none could tell when the control or magnetic field condition took place. However, the brains of four participants revealed a different, unconscious story. For these four individuals, the team observed a drop in alpha waves, some of which decreased by half their typical size. This suggests an external stimulus was processed by the brain. Illustration of the Farady Cage. Wang et al., eNeuro (2019). Oddly, this change was only registered for counterclockwise magnetic field rotations. The team tested the four participants again weeks later to verify their results and found them to hold true. “What they show is very exciting and seems robust,” says Stuart Gilder, a geophysicist at Ludwig Maximilian University in Munich, Germany, told Science Magazine, adding that follow-up research is needed to confirm the results. While many scientists seem optimistic about the results, other researchers are wary. UC Irvine biophysicist Thorsten Ritz says he’s unconvinced that the drop in alpha waves signifies a magnetic sense of any sort. Due to the asymmetry of the response, the team themselves favor an explanation involving magnetite crystals, which align with Earth’s magnetic field. Magnetite in the animal kingdom has been found in chitons, bacteria, honey bees, homing pigeons, and dolphins. An EEG study in 2002 found no significant brain response to magnetic fields. Kirschvink believes the analysis techniques were not powerful enough to detect any changes in alpha waves. Many questions remain: Why was there a difference in which participants could sense the magnetic field? Does it relate to differences in navigational ability? Does this sense affect our behavior? Can those with weak responses be trained to feel the magnetic field? For now, these are questions for exciting future studies.